What are the benefits of owning a SVN® franchise? When considering the option of franchising, the first question that often comes to mind is, "What's in it for me?" Put simply, franchising provides independent commercial real estate brokerage owners the opportunity to own and run your own business. Franchising with SVN® will provide you with enterprise marketing services, expert training, recruiting assistance, and the opportunity to compete at a national level. The result? Tremendous growth opportunities for your business. 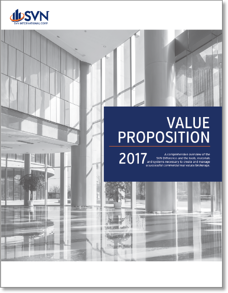 Download the SVN Value Proposition to learn about the SVN® Difference and the tools, materials and systems we offer that are necessary for you to create and manage a successful commercial real estate brokerage.